Park City and Summit County Transit are excited to celebrate our Express Route with the launch of our new Zero-Emission Battery Electric Fleet of Buses. Federal Transit Administration (FTA) and our partners at Utah Department of Transportation (UDOT). Park City Transit and Summit County partnered with Proterra bus manufacturing. Thus, making Park City the first mountain resort community in the United States to operate a Zero-Emission, Battery Electric Express Bus Route. This new express route will provide faster, more efficient service for Park City and Summit County commuters, and assist with the expansion of Regional Transit Services. The Express Bus will run every 10 minutes from Kimball Junction to the Park City Transit Center. 11:00 a.m.- Dedication, Ribbon Cutting, Charging Demo & Media Event. 11:30 a.m. - Noon - Open House, refreshments served. 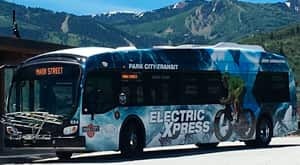 Please join us as we “charge” forward with the first ever Battery Electric Express Route in the State of Utah, which is appropriately named the Park City Electric Xpress.